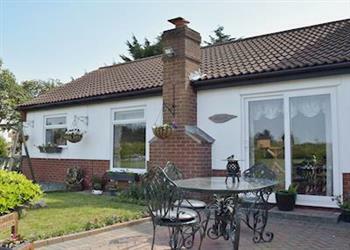 Leanda Lodge in Burgh Castle, near Great Yarmouth sleeps 4 people. Leanda Lodge near Great Yarmouth is a home from home in the popular Norfolk village of Burgh Castle, with the added bonus of a hot tub. Situated in the grounds of the owner’s large gardens and land, guests are warmly welcomed and encouraged to make full use of the facilities and surrounding area. Conveniently located between Gorleston Beach and the traditional Great Yarmouth seaside resort, there are so many places to explore. The Norfolk Broads National Park is within walking distance including the 3rd century Roman Fort and Burgh Castle offering magnificent views. Further inland you can visit Somerleyton Hall and Gardens, a stately home steeped in history, romance conservation and grandeur. The beach is 4 miles from Leanda Lodge near Great Yarmouth. With the shop, pub and restaurant 100 yards. Leanda Lodge is all on ground floor. Living/dining room: With electric fire, 37 Freeview TV and DVD player. Bathroom: With shower cubicle, shower seat and toilet. Oil central heating, electricity, bed linen, towels and Wi-Fi included. Welcome pack. Lawned garden with patio and garden furniture. Shared 2.5 acre natural grounds. Shared hot tub for 4. Private parking for 1 car. No smoking. Holidays at Leanda Lodge run from Saturday to Saturday. For a better idea of where Leanda Lodge is, you can see Leanda Lodge on the map below. Leanda Lodge is in Norfolk; should you be on the lookout for a special offer, you can find all the special offers in Norfolk. It's always worth checking to see what is on offer at the moment. Do you want to holiday near Leanda Lodge (UKC415), you can see other cottages within 25 miles of Leanda Lodge; have a look to find your perfect holiday location.